Music You (Possibly) Won't Hear Anyplace Else: The jazzy Jazz Age, post-ODJB! Or, Was It Jazz? The jazzy Jazz Age, post-ODJB! Or, Was It Jazz? Jazz history, as written, is sort of an on/off; true/false; yes/no kind of thing--either it's jazz or it ain't jazz. For every 25 bandleaders, solists, etc. whose music "wasn't really jazz," there were a couple of bandleaders or soloists whose music "was jazz." Or may be it was for every 50. Stan Kenton? Dave Brubeck? George Shearing? Jury's out (coffee break). What do all of the "not jazz" folks have in common? They were popular! Ordinary, everyday people listened to them. Traditionally, jazz is regarded as what The People didn't (and don't) listen to. 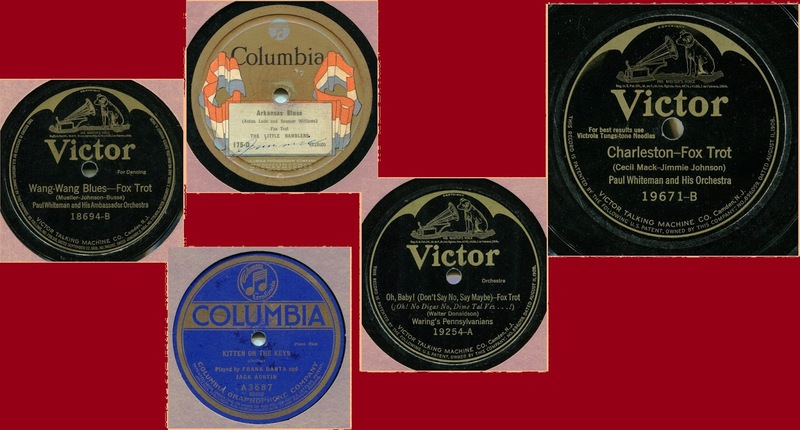 But a lot of jazz managed to get into the pop records of the post-ODJB period, and today we're going to hear a large number of them, from the big-band-ish early-'20s discs of Paul Whiteman (with their excellent Dixieland-chorus closings) to "hot" and peppy efforts that scream "Break out the flappers"--Whiteman's 1924 San, George Olsen's Hot Aire (1925), Fred Waring's Oh, Baby! (1924), arranger Ferde Grofe's take on Charleston (1925), and Ralph Williams' all-time great rendition of Prince of Wails (1924). There was a heck of a lot of area between jazz/not jazz. We'll be visiting it today in honor of the Original Dixieland Jazz Band's 100th (first recording) anniversary. The ODJB's Dixieland hits opened the door. Just a note from a total stranger to say thanks for the great tunes and the great transfers. I used to follow your blog, and was recently led back by "Big 10-Inch Record." So as I'm downloading the fruits of your transfer labors it only seemed appropriate to give a big 10-inch thank-you. Kosty speaks! The voice behind the baton. Quiz: Did washing machines exist in 1874?